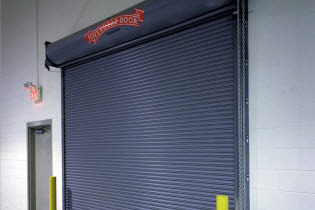 Overhead Door offers a wide array of rolling steel doors to meet the most demanding fire safety standards, unusual opening sizes and discerning aesthetic requirements. Designed to close automatically in the event of a fire or alarmed event, our fire-rated doors are available for service door and counter applications in commercial, industrial, institutional and retail projects. Overhead Door provides fire doors with UL or FM labels, and are listed for both masonry and non-masonry applications. Our FireKing® fire door collection offers fire protection, innovative design, and optimized performance for the end user. The Fire Sentinel® time-delay release device provides an added measure of safety to control the doors' closure. 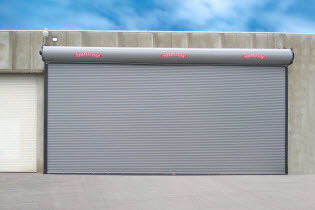 For more information on Overhead Door fire door products, please call Overhead Door Corporation Rolling Steel Technical Service at 800-929-4692. The FireKing® Fire Doors are fire-rated rolling service doors which offer superior protection wherever a listed fire door is required. Common applications include: factories, warehouses, mills, distribution centers and parking garages. 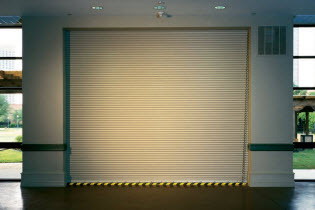 Customized fire doors are available for conveyor openings. These fire-rated service doors feature an innovative floor reset system which allows the door to be easily drop tested and mechanically reset at any time without requiring special tools. Additional protection features, such as Fire Sentinel® and FireLite® vision lites are available options. FireKing® Fire-Rated Door Model 630 is ideal for projects requiring a listed rolling service fire door available in labels up to 4 hours, for mounting in masonry, steel or wallboard. 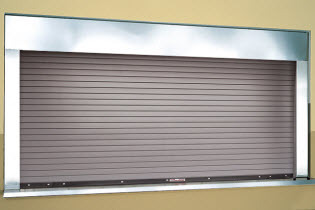 This fire-rated service door also offers the choice of galvanized or stainless steel in 18-, 20- or 22 gauges, as well as flat or curved slat profiles with approximately 200 optional powder coat color options - making this reliable, fire-rated door as strong and durable as it is aesthetically pleasing. FireKing® Fire-Rated Door Model 631 fire-rated fire door is an ideal choice for projects requiring a listed rolling service fire door where both safety and economy are priorities. 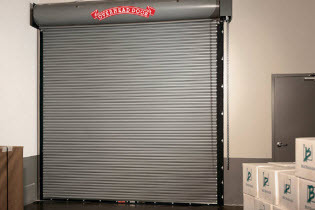 This 24 gauge steel door is available in up to a 4-hour label for doors up to 152 sq ft (14121 sq m). A UL oversize label is available for doors over 152 sq ft (14121 sq m), but less than 12' (3658 mm) in height. FireKing® Fire-Rated Door Model 634 fire-rated fire doors are the highest-rated fire doors we offer and are ideal for projects requiring a listed rolling service fire door. These doors are available with a 4-hour label for openings up to 152 sq. ft. (14121262 sq mm). A UL oversize label is available for openings up to 683 sq ft (63452 sq m). FireKing® Fire-Rated Door Model 635 is a rolling insulated fire door that offers the triple benefits of insulation, fire protection and sound attenuation. This one door eliminates the need for separate fire and insulated doors. The insulated FireKing® fire door meets many performance requirements including those of: UL, FM, New York City, California (CSFM) and optional "S" smoke label with up to four hour UL label. This door offers the protection of a fire door combined with the energy-efficiency and sound transmission control of an insulated door. These doors offer up to a four-hour rating on masonry, concrete and steel walls, and up to a three-hour rating on non-masonry walls to satisfy a variety of applications. 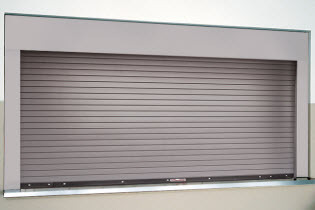 Fire-rated counter door Model 640 primted galvanized steel and Model 641 fire-rated counter doors feature 22-gauge steel and are ideal for applications where safety is as important as style. The 640 and 641 model doors are ideal for openings requiring a counter-type fire-rated door. Common applications include factories, schools, concessions, hospitals, cafeterias and retail settings. 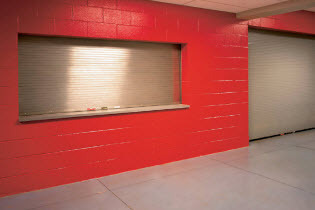 Fire-Rated Counter Door Model 640 has exposed components made of primed galvanized steel. Fire-Rated Counter Door Model 641 has exposed components made of stainless steel. Standard labels are available in a 3 hour UL Class A label for masonry applications, or a 1-1/2 hour UL Class B label for non-masonry fire walls (a 3 hour non-masonry UL label is available upon request). These doors are designed to expand upward in a fire, allowing the guides to be installed flush with the sill. Their compact, box-like form also provides an attractive finished appearance that requires minimum side room. Oversize UL labels are available for certain applications. A host of standard and optional features further improve performance of these doors beyond the norm in fire-rated applications. Added protection features, such as the Fire Sentinel®, horns and strobes are available. Integral frame counter fire doors (Models 660, 661, 662) provide a handsome finished appearance for a variety of applications, including food service counters. 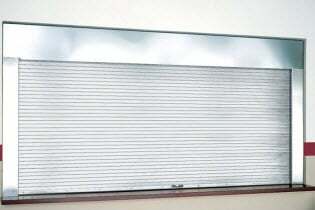 Available for opening sizes up to 9' x 5' (2743.2 mm x 1524 mm), these doors carry a 1-1/2 hour UL Class B label and are factory assembled as a complete unit with fully welded frames. The frame comprises 16-gauge jambs and header, and is complemented by a 14-gauge sill, plus hood and fascia. Added protection features, such as the Fire Sentinel® are available. Door guide assembly rests on the sill or floor to provide an attractive finished appearance eliminating setup gaps. Guides expand upward during a fire. 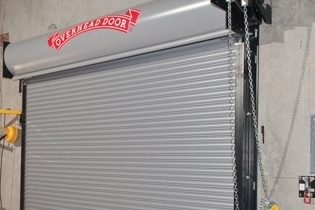 Motor operated counter fire door does not require tension reset after automatic fire release.